The ZAPP GUIDE to Thank You Letters reveals 7 fundamental ingredients of an impressive acknowledgement. And when you do a great job of executing these fundamentals you'll end up with a thank you letter that will touch the heart of your donor. Best of all, when you touch their heart . . . when you make them feel needed . . . when you show them how they helped make a true difference . . . when you ooze sincerity . . . when you show how you value them beyond the money they give . . . then you're far more likely to retain this donor. Wouldn't you prefer to keep 2, 3, 4 or more out of every six you acquire? A powerful donor cultivation and recognition plan - which includes thank you letters done correctly - will go a long way toward retaining more donors for your nonprofit. How? Because donors want a rewarding relationship with you and your cause. Yes, they feel good when they donate because they believe they're doing the right thing . . . they're helping a person in need in a way they couldn't possibly do by themselves, as an example. But study after study reveals that you can't simply take your donors' money and leave it at that. To ensure your donors give generously again and stay with you for a longer period of time, you must nurture your relationship with them. Just like you, donors want to feel appreciated. They also value good customer service. As a nonprofit you need great customer [donor] service just like any for-profit company does. In the fall of 2008 I read about a survey (for-profit sector) where 87% of consumers said they've stopped doing business with a company after getting poor service. That's an increase over 2007 when 80% said they stopped; and also up from 2006 when 68% said they stopped after poor service. That's a strong upward trend. Another survey from 2008 revealed only about 13 percent of donors say their experience with nonprofit organizations exceeds their expectations. Now the news isn't all bad . . . 83 percent said it met their expectations. Strive for WOW and you'll retain more donors. This means lower acquisition costs and greater net revenues. You'll have less work and more funds for your mission work. And great thank you letters are a tool to help you do all this. In the U.S. alone, there are 1.2 million nonprofits registered with the IRS. Donors have many, many choices. For donors to choose you and STAY WITH YOU . . . a big part of what they're looking for is to feel appreciated. How can you show your appreciation? How can you demonstrate your exceptional customer [donor] service? How can you break out of the pack and exceed donor expectations? One of the simple ways: A well-crafted thank you letter that's delivered on time will set you apart from the majority of other nonprofit organizations. You'll make a stronger, warmer impression on your donors who will be more inclined to continue supporting your cause. Here's a peek at what's inside your copy of "Thank You Letters" . . .
How to begin your letter; what needs to be in the all-important first paragraph. Ideas, suggestions and ways to write a heartfelt and personal letter to someone [a donor] you haven't seen or met . . . a complete stranger. View a sample thank-you letter. You'll see an actual letter with the 7 fundamentals in action. Examples of text you can use in your own letter. The structure of your letter is laid out from the salutation through the P.S. Find out WHEN you ought to mail your letter. How soon after receiving the gift. Do you know what other purpose your thank-you letter can serve? You'll soon find out. A great tip on how to audit your own acknowledgement process. Besides saying "thank you," what other messages should you share? There are at least two and your ZAPP GUIDE spells them out for you. Find out the "how-to" do it as well as the "what" to do when crafting your letter. How long should your thank you letter be? 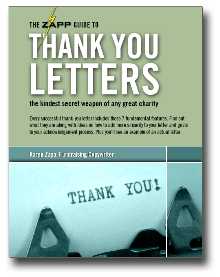 Besides personalized form letters of acknowledgement, on page 7 you'll read about another powerful way to say thank you.